Keeping properties clean and trash free is an important concern for facility managers. Outdoor trash receptacles need to be durable, convenient and secure. 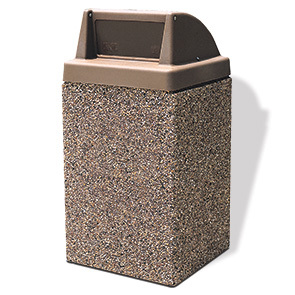 Enhance waste management programs with the 45 gallon concrete receptacle. Servicing this large capacity concrete receptacle is easy, open the self-latching metal side door to access the ridged plastic liner. Constructed with reinforced concrete, this heavy weighted receptacle stand strong through the harshest of conditions. This receptacle is topped by a push door lid that keeps trash contents out of sight, precipitation and unwanted creatures out, while concealing odors. This push door lid is bolted to the trash receptacle for added security.